Excellent. 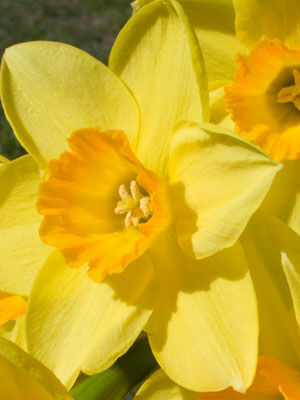 Most daffodils are hardy to -32C (-25F); cold tolerance varies with species. Topdress with rich compost in Winter, when new growth appears. Fertilise established clumps with a balanced organic fertiliser in the autumn. The earliest daffodils bloom before most other flowers and shrubs. Planting daffodils behind daylilies or other summer-blooming perennials hides the fading daffodil foliage from view. Set out dormant bulbs during autumn. Cover the bulbs to four times their depth with loose soil. Allow 10cm(4in) between bulbs of miniature daffodils, and 15cm(6in) between taller varieties. Daffodils are the best spring-flowering bulbs to grow as perennials. Yellow and white are the most common flower colours. Cut daffodils to use as cut flowers when the buds are full and almost ready to open. They will continue to open indoors for several days. As the flowers fade in the garden, trim them off with scissors or secateurs. Daffodils have few pest problems. Large, double-flowered varieties are prone to falling over when the blossoms get heavy with rain. Daffodils benefit from 6-8 weeks chilling in warmer areas before planting out. Best recommended as annuals in warmer areas such as the tropics and subtropics.